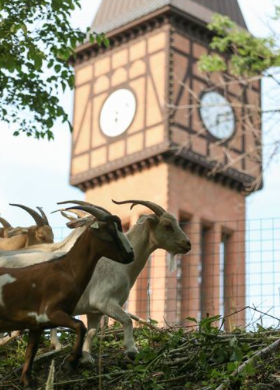 Did you know that goats were roaming around in Goebel Park last year as a creative way to rid the park of invasive plants and make less traveled areas of the park safer? Did you hear about the artist who visited from Savannah to lead a discussion about public art and create a massive mural with Glenn O Swing Elementary students? Have you heard about the students at Holmes Middle School who are learning how to sew, knit, and create their own masterpieces? Or the solar powered sundial in the Westside that will tell you the time using your shadow? In case you missed them, The Center for Great Neighborhoods is inviting the community to learn about these initiatives, and the 12 other creative projects funded by The Center last year. On Wednesday, January 6 at 7 p.m. at Pique (210 W. Pike Street), The Center, Pique, and local artist Baoku Moses are partnering to bring Covington a celebration showcasing the creativity of regional artists and their Covington community-based projects. In 2015, The Center provided funding for 16 artists who used art and creativity to take on community issues while also fostering a sense of community pride, celebrating Covington’s Bicentennial, and strengthening the city. Attendees will enjoy visual displays of all 16 Creative Community Projects, an interactive performance with Baoku Moses (bring your own drum or one will be provided for you), the first look at the Bicentennial Time Capsule, and will have the opportunity to learn more about the Creative Community Grant Program and the upcoming 2016 projects.